What's in season, BIG, BIG pickerel are in season, and they're stacking up in the Bay of Quinte right now. This is the time of year the big girls hang out in the Bay, near Picton, and most times they're hungry. We spent a few days on the bay fishing for them, using Wally Divers, and managed a few and an incidental pike too. The wind hampered both Saturday and Sunday fishing, but we perservered and fished in it anyhow. Not an easy task. 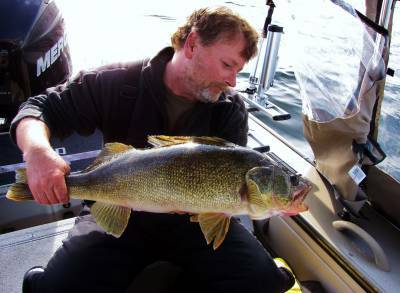 The Bay of Quinte is famous for being windy and one should not fish there if you do not have a large enough boat or are not experienced in fishing rough water. For those who are and have a good boat, the fishing can be outstanding. Aside from the big pickerel, there are perch, pike and giant sheephead (freshwater drum). Even though the pickerel (or walleye) are big, they still generally give a light bite, most times stunning their prey, (the lure), and then striking. It can be hard to tell you even have a fish on at times and will only find out when your planer board is not where it is supposed to be. Other times, the line will just scream off the reel as soon as you have a hit. If fishing they bay, it is important to note that there are certain areas you may use two lines each, and other areas you may only use one line each. Be sure to check for this before fishing the area as you will be illegally fishing if you have too many lines out and that could be a big fine and/or confiscation of your equipment.